$IBM has been one of those stocks that traditional investors buy and hold forever. Forever never lasts forever though. If we take a look at their chart below, we can see a lot of warning signs in there. Dark cloud covers as well as bearish engulfing candles are showing up. It has traded flat since their last earnings release about a month and a half ago, but that 3.53% drop to $155.38 on high volume was huge not only because they are already in a death cross, but also because they have now hit a 3 year low in stock price. 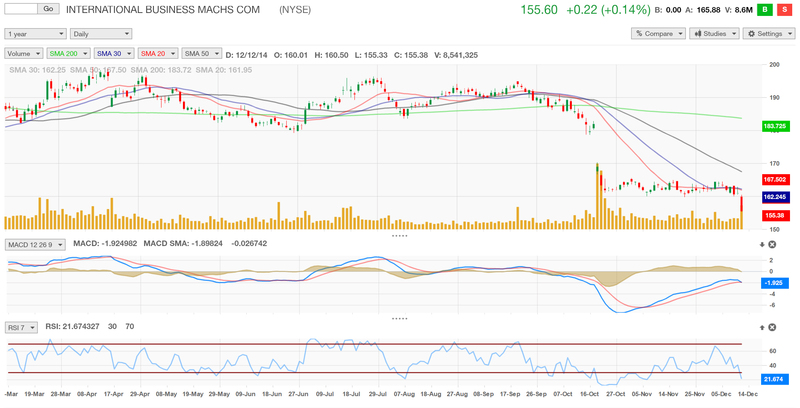 To make things worse for IBM, their MacD and RSI for the year is looking weak. I would sell calls on IBM because even though they dropped over 3% on December 12, they are usually a slow moving stock, so buying puts would eat into your profits because the stock does not move up or down aggressively on a consistent basis. I would expect this stock to continue its trend down until their next earnings release.